In May, the IMMOCHAN Foundation for Social Entrepreneurship, co-organizer of CRÉENSO competition with IÉSEG School of Management and IÉSEG Network, the IÉSEG Alumni Association, presented the three winners of the 2014/2015 edition with their prizes. • Support from an IÉSEG Master student. Throughout the academic year, the student assists and supports one of the entrepreneurs that have been nominated in the area of his/her Master specialization: marketing / communication, audit / management control, human resources, management … as required by the supported project. • € 20,000 is also awarded by the foundation to the three top prize winners (€ 10,000 for the winner of the 1st Prize, and € 5 000 for the 2nd and 3rd places). Jérémie Loevenbruck (Palanca), accompanied by IÉSEG student Nail Rida Sbai , receives the 1st Prize awarded by the IMMOCHAN Foundation for Social Entrepreneurship. Of the 60 applications received for the 4th edition (2014/2015) of the competition, 15 entrepreneurs benefitted throughout the year from the support of IÉSEG students. In May, the CRÉENSO jury then met to attribute the three top prizes that were then presented at a ceremony at the IÉSEG campus in Paris. The first prize € 10,000, went to Palanca, a company based in Toulouse (studies, consultancy and training in CSR and sustainable development for companies and individuals). 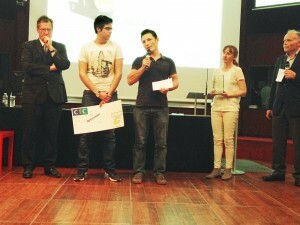 The 2nd prize of, € 5,000, went to SoScience (a company that promotes Responsible Innovation ‘and develops its practice in industry, research centers and higher education) while the 3rd prize, € 5,000, went to NX Vision (a start-up that develops a shared platform for mobile payment services and which looks for example to promote financial inclusion in rural areas of Sub-Saharan Africa).